Hi. Excuse me. Two seconds here. This story's about me, not him. I wrote a review for the base game of Altiplano in 2018, so if you’re not familiar with Altiplano itself, I recommend checking out that review first (click here to read it). If you are familiar with how the base game plays, then I invite you to dive into this review of Altiplano: The Traveler, an expansion from Renegade Game Studios. An example of an event card (left) and an asset (right). I love the base game of Altiplano, so I was really excited to see what The Traveler brought to the highlands. From the get-go, I liked being able to trade. It took some remembering (oh yeah, trading), but once we got used to the idea, the goods flowed like honey. It was a sweet and delicious smorgasbord of goods being put out to pasture—ours for the taking! With the base game, I sometimes got carried away with one type of good, and by the end of the game was practically swimming in it. This expansion not only lets you get rid of goods for good, but allows you to use that unwanted good to gain an asset that will help kick your strategy into high gear. Again, trading did take some getting used to before I remembered I could do it (so long as I shared a location with the traveler pawn, of course), but once I did, my options opened right up. I used the traveler strip’s action space to store unwanted goods—saving them there to use the next time I visited the traveler—and was able to trade goods for rare (to me) goods, like stone (or, you know, silver and ore). The opals, too, looked great, and while worth one point for every two, what I really wanted them for was to hold and look at (because it’s apparently been a minute since anyone on the Altiplano has seen something so shiny). Overall, my experience with this expansion was favorable. In fact, I daresay I won’t play Altiplano without this expansion. It doesn’t add a whole bunch of new things, but the things it does add turns the base game from a wonderfully rich experience to an even more wonderfully rich experience (bet you didn’t see that comparison coming). I love it, and it will forever hold a place at our table alongside the base game of Altiplano. Next, separate the event cards into their respective sections (A, B, C, D, and E). Shuffle each lettered deck and then use all “E” cards, three “D” cards (not to be confused with 3D cards, which are not included with this game), all “C” cards, three “B” cards, and three “A” cards. Place these cards on the table so that “A” is on the top and “E” is on the bottom, with the others falling in alphabetical order. Place the new Trading location in the center of the table, in the middle of the other locations. Each player takes a cube of their player color and plops it into one of the cube-shaped spots provided in that location. This space where your cube plopped is your personal trading space. You can never trade for goods here, but you can trade and place goods here. Asset cards go on their respective “I” or “II” spots, with “II” face-down and “I” face-up. Level “II” asset cards will become available later in the game through an event. The traveler pawn starts on the road, and each player receives a traveler strip, which is placed above, below, or otherwise near the player board. Point markers and opals are dumped onto the table in some sort of orderly supply (if order is what you desire). A new phase—Phase 0—is added to Altiplano with this expansion. In Phase 0, the top event card is drawn. An event with a lightning bolt affects all players and is resolved immediately (in turn order, of course). Events without a lightning bolt icon affect all players continuously throughout the round, that effect dictated by the card text. Any event cards showing the little traveler guy means one good (of the type shown) is placed in the neutral trading space. This is how he acquires goods to trade. The traveler strip has new actions on it, including trading goods for opals, opals for goods (either from the neutral trading space or another player’s trading space, but never your own), or trading goods for assets (only one asset per round, please). Some assets cost a good that is easy to come by (wood, stone, etc. ), whereas others cost goods that are more rare (cake—er, cloth—glass, silver, etc.). These actions may only be taken if your player pawn is physically at the same location as the traveler. The traveler, however, is shy and runs away from people. At the end of each round, the traveler moves clockwise to the next location that is unoccupied, so during the round, you’ll have to make sure you have enough movement left over to stalk the man effectively. For scoring purposes, every two opals count for one point (in the form of a point marker, which is important distinction from merely an arbitrary point). One opal by itself is worth nothing. And... that’s it! Those are the differences. It doesn’t look like much, but it’s everything. See “The Good” and “Final Thoughts” below for more on why. The art on the new board and cards doesn’t vary in style from the base game, which is great. It all fits right in and looks wonderful. As for components, they’re (again) the same as those that came in the base game. There are new opals, however, that differ in shape and material than the other cardboard pieces. These opals look great and feel fine. I actually find myself wanting to trade for opals just to get some to hold. One of the best things The Traveler expansion brings to Altiplano is that it makes it a bit easier to get goods that are otherwise difficult to come by. Some games I’m hurting for alpacas, while others have fish as the illusive good. With the new Traveler actions, players can trade opals for goods, which come through event cards, as well as by other players trading whatever good they deem worthy for assets. In the base game, some goods were simply not to be had during a given session; now, it’s always possible to get what you need. The new Traveler actions give players a place to unofficially store some goods that they would otherwise not be using in a given round. Likewise, these goods that have no other pertinent use to the player can be traded for assets and opals. When trading for assets, the goods traded go to that player’s trading space, which is a great way for thinning out your bag of goodies when you realize you’ve been putting too much stock in food and stones (guilty). Consider it like trashing a card in Dominion (or other deck builders), thus thinning out your deck. Same concept. The event cards shake things up, giving everyone a helpful boost during each round. This may come in the form of spending a coin to gain a cart (without stopping at the village! ), or all extensions costing one less for the current round. These events can help speed up the game, since it’s easier to get things done. The assets are essentially unique player powers for purchase, and can really help with strategies. With enough Tetris-ing, this expansion fits inside Altiplano’s base game box! It’s a tight squeeze, but this is worth making mention of, as it means I don’t have to carry two boxes around everywhere I go (because I obviously carry Altiplano with me everywhere I go). The Traveler expansion comes with some really large baggies—large enough to fit the not-so-little location boards from the base game. With each location board, I also included all components associated with that board. This makes setup a lot easier and faster. I’m always a huge proponent of adding baggies to a game. I have nothing ill to say about Altiplano: The Traveler. If you don’t like certain aspects of the expansion, leave it out (i.e. don’t include the event cards, get rid of the traveler but include everything else, etc.). But as far as I’m concerned, it’s all good here. There are some expansions that are fun to play with, but not necessarily…necessary. And then there are some—such as Beyond the Black for Tiny Epic Galaxies—that are absolutely necessary. It’s not that these expansions fix an otherwise bad game, but they bring with it more depth and strategy. Altiplano: The Traveler is one of those expansions that I will never play without. The base game is wonderful, but The Traveler expansion provides more ways to use goods, along with a useful way of permanently getting rid of some. The events add a little nudge each round, and the new order, boat, and house cards—while not necessarily…necessary—do bring variety to the game. 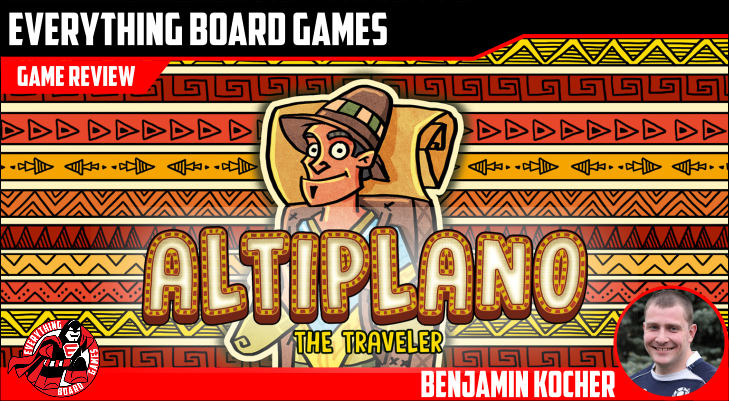 Altiplano: The Traveler is that quiet kid in the movies that doesn’t really say much, but has the best punch lines whenever he does speak. Alright, bad analogy. What I mean to say is, this expansion might not look like much, but it definitely delivers. The new additions make an already admirable game something to be elevated on a pedestal, fed grapes, and given a butler, chef, and Theme Song Guy (Oh yeah!). Obviously, if you like Altiplano, then you will certainly want to consider Altiplano: The Traveler.